Time to do the spooky throw down at the Brewery! This years Brewery Bash is looking to be one of the biggest yet. Soulservice is taking the main stage with activities and food for everyone. The whole day we will be thumping to the sounds of DJ Apollo. $25 gets you entry to the event, access to venders, endless BBQ, and 2 pint tickets. This year the costume contest is looking to be intense! Dress up as your favorite character and compete for multiple categories. Bigger and better prizes than ever before! Donations will be taken for The Homeless Period Project . 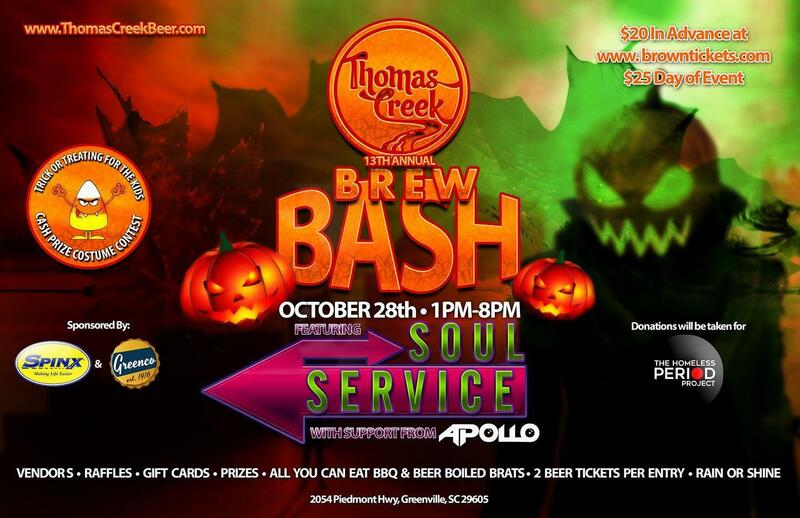 Each donation will recieve a raffle ticket for some Thomas Creek gift cards and goodies. GHOULS Area from 1:00 - 5 PM. 2:00 and 4:00 PM it's "Spooky Story Time" with Danielle Crumley. Not to mention Trick or Treating for your scary monsters! !